All of the components of the learning process are included in this interactive digital lesson about the geography of Ancient Rome. Students will have the opportunity to predict, map, evaluate, infer, analyze, assess and apply their understanding as 21st century learners. - Students analyze an image of Ancient Rome and predict the impact the geography will have on life in that region. - They visit numerous websites to map the physical features of Rome. - Students watch a video to learn about topography, and evaluate a topographical map of the Italian peninsula. - They examine a map showing the 7 hills around the first settlement in Rome and infer what that meant about life there. 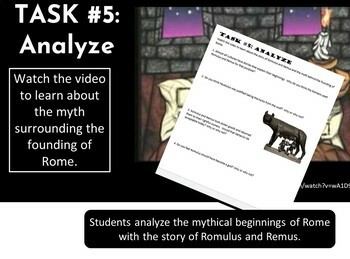 - Students analyze the story of Romulus and Remus. - They examine a website to assess the impact of neighboring cultures on the development of Rome. - To apply their learning, students answer the focus question in a paragraph: How did the geography of Rome impact early development of the civilization? 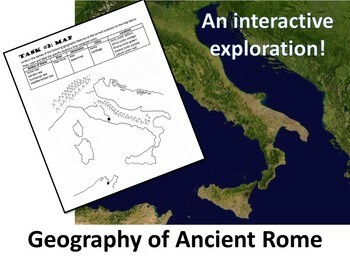 Everything you will need for students to understand how the physical geography supported the rise of civilization in Rome is included with this activity! * Packet for students to complete as they go through the Tasks 1-8. * Access to Google Slide presentation that has resources and directions for students to complete each task. * Complete Teacher Guide that describes what students should be doing at each task.